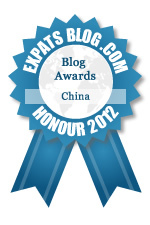 Living, eating and experiencing China as the wife of a working expat. In my opinion, one of the funniest blogs out there! She manages to inject humour into those sad and lonely moments we all experience as expats. I have never been to China, but she makes me want to go there! Even if they spit everywhere. A talented and gifted writer with an extaordinary sense of humour and observation. This blog is a gem and must become a book! This blog is a treasure-trove of spirit enriching gems. Every visit uplifts and broadens horizons. She has a positive energy that shines through and an amazing amount of info is dished up with a GREAT sense of humour! Would be the first to grab this off the shelves should it be published! The talent lies not only in the prose, but in the photography too. I love reading this blog and eagerly anticipate next post! I love this whitty blog... it's so easy to relate to and I find myself drifting off and imagining myself in China! You truly have found your calling! I always look forward to another article appearing in this blog. Whether it be food, travel or just life experiences, she manages to entertain and her photography is exceptional. Witty. Entertaining. Insightful. And most of all, full of useful tips. Love it! Living vicariously through these posts. Simply joyous !